Whereas the Germans launched the first and second battles of Ypres, Third Ypres was launched by the British and Commonwealth forces. Haig had toyed with the idea of launching a major offensive in Flanders. It was his preferred choice for 1916 but the Battle of the Somme took precedence in that summer of 1916. 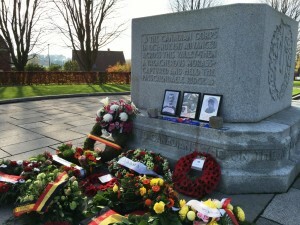 Third Ypres began on 31 July 1917 and continued until the village of Passchendaele fell in early November. Although the battle resulted in a number of gains for the Allies, it was by no means the breakthrough that Haig had intended and the gains that were made came at a tremendous cost in human terms. Referred to today simply as ‘Passchendaele’, the tactics employed at the Third Battle of Ypres are as controversial as those used at the Battle of the Somme fought a one year earlier. 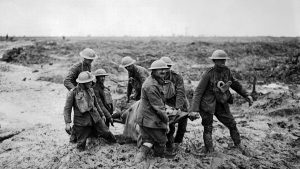 Passchendaele was perhaps the last great battle of attrition fought in the war. The French Nivelle Offensive ended in failure in May with mutiny spreading throughout the French army. Determined to press ahead with plans for a major British offensive in late summer Sir Douglas Haig set his plans in motion. The British Admiral Jellicoe issued a warning that the current level of shipping losses would prevent the British from sustaining the war into 1918 unless German submarine bases along the Belgium coast were cleared. Haig considered this an urgent requirement but was also interested in breaking out of the Ypres Salient and at the same time break the will of the German army, which he believed was very near to collapse. This was a view he had held twelve months earlier at the height of the Battle of the Somme. David Lloyd George, the British Prime Minister (pictured right), was opposed to the Passchendaele offensive, and later came out highly critical of Haig’s strategy and tactics in his published memoirs, but in the absence of a credible alternative to Haig he felt obliged to sanction Haig’s plans. 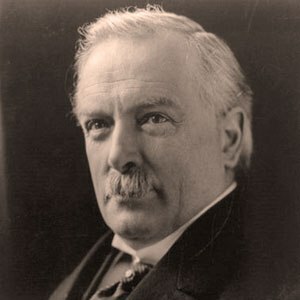 Lloyd George was however encouraged by the success earlier that summer when the Battle of Messines took place on the 7 July. Under the command of General Plumer, the Second Army had captured Messines-Wytschaete (referred to by the Tommy as ‘White Sheets) ridge. This success was undoubtedly the precursor aimed at capturing the Passchendaele ridge. However, Plumer advocated that the attack should be carried forward immediately onto the Passchendaele ridge as the morale of the German troops was broken at that given time. They were also suffering a shortage of troops which would almost certainly guarantee the Allied capture of the ridge. Haig however disagreed, choosing not to bring forward his plans from the end of July. With the possibility of a Russian withdrawal from the war, action certainly needed to happen in that summer of 1917. Were the Russians to leave the war it would enable Germany to transfer her Eastern forces to the Western Front and therefore increase the Germans strength. Haig needed a General to command his offensive. Plumer and Rawlinson effectively turned down this role. Plumer disagreed with Haig’s plan and Rawlinson had already had his fingers burnt on the Somme. And so Sir Hubert Gough (pictured left) who had said that ‘the British army could beat the Germans anywhere, any place and any time’ was given the job. The Third Battle of Ypres was opened by Sir Hubert Gough’s Fifth Army, with 1 Corps of Sir Herbert Plumer’s Second Army joining on its right and a corps of the French First Amy led by Anthoine to its left: a total of twelve divisions. As usual, a heavy preliminary artillery bombardment was effected for the ten days prior to the launch of the attack at 03:50 on 31 July. The bombardment made use of 3,000 guns which fired four and a quarter million shells at the German lines. This bombardment lost the allies the element of surprise and the German Fourth Army expected an imminent offensive. When the attack was launched across an 18 kilometre front the Germans were in position to hold off the main British advance around the Menin Road, and restricted the Allies to fairly small gains to the left of the line around Pilckem Ridge. Similarly the French were halted further north. The heaviest rains for 30 years hampered British attempts to renew the offensive over the course of the next few days. These rain combined with artillery churned the Flanders soil into a thick muddy swamp. The mud immobilised the infantry and their field guns. Tanks found themselves immobile and stuck fast. Ironically the very force of the preliminary bombardment had itself destroyed drainage systems, exacerbating the problem. In addition, the artillery shells that had rained down in the days prior to the attack’s launch had peppered the very ground that needed to be traversed by the advancing Allied forces. As a consequence of this, no renewed major offensive could be contemplated until 16 August, when the Battle of Langemarck saw four days of fierce fighting which resulted in small gains for the British, but heavy casualties. Dissatisfied with progress the British Commander-in-Chief, Haig, replaced Sir Hubert Gough (by moving him and his forces further north) with Herbert Plumer. Whereas Gough favoured sweeping aggression, Plumer planned a series of small gains rather than an all-out breakthrough. The attacks began anew on 20 September with the Battle of the Menin Road. This was swiftly followed by the Battle of Polygon Wood on 26 September and the Battle of Broodseinde on 4 October which was ostensibly conducted by the Australian Infantry Force (AIF). These two battles established British possession of the ridge east of Ypres. Encouraged by Plumer’s small gains, Haig pushed for more and to continue the offensive towards Passchendaele certain in the thought that the German army was close to collapse. Little progress towards this end was made at the Battle of Poelcappelle and the First Battle of Passchendaele, on 9 October and 12 October respectively. The Allied attackers were now nearing exhaustion and German reserves released from the Eastern Front began to pour onto the ridge. Canadian forces under the command of General Arthur Currie were brought into the Ypres Salient. 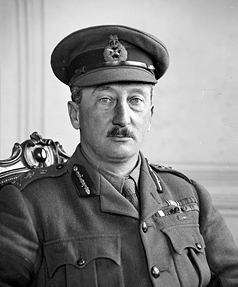 They had had success at Vimy Ridge and Currie was not surprised when he received orders to proceed to Ypres. 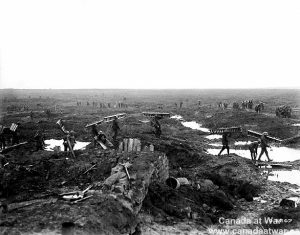 The Canadians orders were to capture the town of Passchendaele. To do this, Currie requested and received more artillery and time to attempt to drain the battlefield. On the 28 October and after a large artillery bombardment the Canadians attacked. 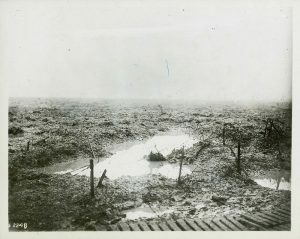 The eventual capture of Passchendaele village by Canadian forces on 6 November finally gave Haig an excuse to call off the offensive claiming success. Haig sent his Chief of Staff, Sir Lancelot Kiggel, to view the battlefield and the captured village. When Kiggel saw the conditions that the men had fought in he sat down and cried saying ‘How could we send men to fight in this’. The Third Battle of Ypres was, like its predecessors, a costly exercise. The British Expeditionary Force (BEF) incurred some 310,000 casualties, with a similar, lower, number of German casualties: 260,000. The salient had been re-widened by several kilometres. Haig comes under intense criticism for this offensive. The reasons being that he persisted with the offensive after it was clear that a breakthrough was unlikely. Critics have argued that the main launch pad for the attack should have been sited at Messines Ridge, captured by Plumer in June; but Haig’s original plans precluded this, viewing the capture of the ridge as a necessary diversion, and he declined to modify his plans: evidence, some say, of an inflexible strategy. Numerous factors are cited to support Haig’s decision taken to continue the offensive. Russia’s withdrawal from the war, British vulnerability to submarine attacks launched from the Belgian coast, and weakened French morale which turned into a widespread mutiny makes it clear that a decisive strike must be attempted before the Allied war effort collapsed. It is also argued that the turn in the climate could not have been predicted and that the rainfall was by far the heaviest for many years. Indeed, fighting had taken place around Ypres since 1914 without the kind of problems experienced during Third Ypres. Haig himself argued that when regarded as a battle of attrition, the German forces could less afford the loss of men than the Allies, who by this time were being supplemented by the entry into the war of the U.S. This view is shared by a number of German contemporaries. The controversy continues today; however most historians question Haig’s decision not to call off the offensive earlier than November, when at least a number of the core objectives had been attained, and it became clear that the French forces would remain in the field. Many of our WW1 battlefield tours cover the Third Battle of Ypres. 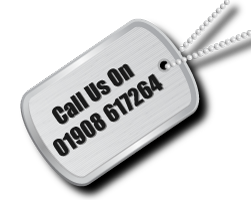 Or call us on 01908 617264 for further help.